Getting into tertiary is an expensive affair, but the benefits of higher education outweigh the cost. In a country in which the unemployment rate is high, one cannot depend on a matric certificate. The labour market is saturated and employers seek highly skilled individuals to occupy permanent positions. Unlock the opportunity to study further with www.kalahari.com. Enter our mindblowing competition and checkout the lowest prices on textbooks to make sure you make the grade. Unfortunately a large number of qualifying matrics will not have access to higher education. Studying further is expensive and the cost of textbooks will put a dent in your budget, it can only go that far. You don’t need a miracle, just a bit of magic. With a flick of the wrists, Karl Ahari, kalahari.com’s infamous street magician, puts his mad skills to the test with his biggest trick yet! He is about to make R60 000 in tuition fees disappear! Imagine winning free studies for you and a friend; it is possible with our Win Tuition competition. You and your bestie won’t have to worry about loans, the possibility of forfeiting that bursary or paying back financial aid, ‘cause you’ll each score a mindblowing R30 000 towards your fees. Paying for higher education has never been this easy! To stand a chance to win, all you have to do is enter online at www.wintuition.co.za. There are also awesome daily prizes up for grabs, such as the gobii smartphones & tablets, vouchers and more. 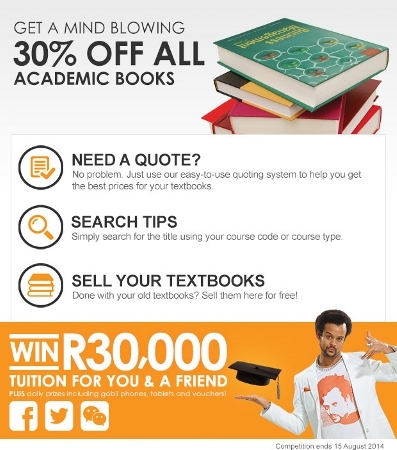 In addition you can score 30% off all academic textbooks by shopping online at kalahari.com’s Academic Bookshop! Get your study guides, literature, prescribed books and academic eBooks for less. You can even save 30% off CAPs curriculum textbooks for grade school for your younger brothers and sisters or kids. Kalahari.com also offers free quotes for all textbooks list, especially handy for bursary application purposes. Now you can get all your academic books in one place when you shop online. Skip the queues, save and get your all your textbooks delivered to straight to your door.